Après une année dans le service de santé aux armées, ayant repris son métier dans le civil, il ne se décourage pas et suivant sa passion pour la BD, il démissionne finalement en 1985 pour ne se consacrer qu’au dessin. Il crée un studio puis une petite agence de pub, publie dans Midi libre, et monte régulièrement à Paris présenter son travail pour essuyer tout aussi régulièrement des refus. Il publie néanmoins sporadiquement dans des revues BD franco belges. Parallèlement, il publie à compte d’auteur « Destins croisés » en 1986 puis deux autres albums suivront chez des éditeurs régionaux. En 1988 les éléments se déchaînent, inondant la ville de Nîmes et détruisant une grande partie de ses biens. Mais passe la galère, son opiniâtreté va enfin payer. Après cinq années de tentatives, il est enfin repéré par Dargaud en 1990, il signe en 1991 pour « CRS=Détresse » qui sortira en album à partir de 1993. C’est le début d’une belle série, puisqu’elle va s’étendre sur 15 années et 13 albums dont il confiera le scénario à Gilles Corre à compter du second album puis au prolifique Raoul Cauvin à partir du quatrième et ce, jusqu’à la fin. D’autres titres viendront émailler cet ensemble avec des « one shot » comme « Fort Braillard » pour Spirou , « Woker » ou « Big Twin », les mini séries « Doc Véto » (3 tomes) avec Godard ou « La Esmeralda » qu’il scénarise pour Jean-Marc Stalner au dessin. Chez « Bamboo » il publie aussi « Les damnés de la route » (10 tomes) ou « Les hockeyeurs » (4 tomes), adaptation de l’édition de sa série à succès canadienne qu’il co-réalise avec son fils Mel qui est aussi son coloriste. Avec « WANTED » (Ed. Valentine) il dévoile enfin ses caricatures à la gouache. Repéré par Morris en 1999 pour sa participation à un album hommage, il commence à réaliser des strips de « Rantanplan ». Entreprise à priori sans lendemain avec la disparition de Morris en 2001 pendant la réalisation du premier tome. Mais le désir du créateur de Lucky Luke (dont on fête cette année les 70 ans) était que son héros lui survive. On propose à Achdé la reprise du plus fameux cowboy du 9ème art. Il dessine ainsi comme un essai « Le cuisinier français » sur un scénario de Guy Vidal et rares sont les personnes qui réalisent le changement d’auteur. Commence alors cette grande aventure avec des scénaristes aussi divers que Laurent Gerra, Daniel Pennac, Tonino Benaquista ou encore Jacques Pessis. C’est enfin Jul qui le rejoint cette année au scénario pour le futur 7ème album des nouvelles aventures de Lucky Luke attendu pour novembre. A noter que parallèlement à la série classique Achdé crée et anime les nouvelles aventures de « Kid Lucky », préquel en gags de la série historique, offrant ainsi un passé tout en humour au « poor lonesome cowboy ». Achdé nous fait l’honneur d’être le parrain de l’édition STRASBULLES 2016 et souhaitons-lui de donner vie encore longtemps à notre cow boy solitaire. Like many of the great comic authors, H.ervé D.armenton uses his initials as his nom de plume. (Pronounced Ash-Dey in French) In 1961 Achdé was born to a family who’d recently been repatriated from Morocco, growing up on a run-down estate in Nimes. His schooling was similar to that of many of his colleagues for whom illustration was their lifelong goal. Although he wasn’t always at ease in other subjects he excelled in this discipline from a very early age. From 1975 his school drawings led to being published in numerous fanzines. In 1983, after leaving school and spending several months in the Radiography Services in Montpellier and Nimes, drawn by the great outdoors and the spirit of Jack Kerouac, he took a road trip across North America. Alas, after a break spent in the US and Canada, the French Army recalled him for national service. After a year in the medical corps, having returned to civilian life, he continued to pursue his passion for comics and in 1985 finally committed to illustration full-time. He set up a studio then a small ad agency, was published in Midi Libre, and regularly visited Paris to present his work – where he was very often turned away. Nonetheless he was occasionally published in some Franco-Belgian revues. At the same time he authored « Destins croisés » in 1986 then two other titles through regional publishing houses. In 1988 flooding in Nimes and destroyed a good number of buildings. But despite setbacks Achdé’s determination would finally win through. In 1990, after five years of rejection he was finally spotted by Dargaud, and in 1991 was contracted to do the series « CRS=Détresse » which would be released 1993. This was the start of a successful series that would last over fifteen years and thirteen albums, seeing collaborating with writer Gilles Corre for the second and third titles and with the prolific Raoul Cauvin for the remaining titles in the series. Other titles came to embellish the ensemble with one-offs like « Fort Braillard » for Spirou , « Woker », « Big Twin », a mini series « Doc Véto » (3 books) with Godard and « La Esmeralda » which he wrote for illustrator Jean-Marc Stalner. With « Bamboo » he also published « Les damnés de la route » (10 books) and « Les hockeyeurs » (4 books), an adaptation of the successful Canadian series that he co-produced with his son Mel as colourist. With « WANTED » ( Valentine) he unveiled his watercolour caricatures. In 1999, spotted by Morris for his participation on a special edition, he began working on the « Rantanplan » strips. It was a job without a future though as soon after, during the production of the first volume in 2001, Morris passed away. However the creator of Lucky Luke’s desire was that his hero would live on (and this year we are celebrating his 70th birthday). Achdé was asked to take charge of the 9th art’s most famous cowboy. As a trial he drew « Le cuisinier français » written by Guy Vidal and it’s rare that anyone is able to deal so well with a change of author. So he set out on this great adventure with writers such as Laurent Gerra, Daniel Pennac, Tonino Benaquista as well as Jacques Pessis. It was Jul though with whom he collaborated this year for the coming 7th instalment of the new adventures of Lucky Luke, due for release in November. It’s worth noting that at the same time Achdé also draws the new adventures of « Kid Lucky » a hilarious prequel series about the background of our « poor lonesome cowboy ». 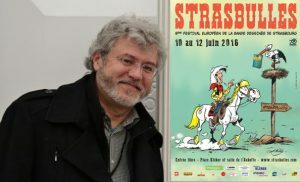 As Guest of Honour at Strasbulles 2016, we very much hope that Achdé continues to breathe life into Lucky Luke for many years to come.